Isleen is Plaisance's quickest to attain her CKC title. She finished in 3 shows at 9 1/2 months on a Group 1 win. Isleen had a BPIS win and a Group 2 her first day out. She is a RBPIS and a multiple Puppy Group winner and Group winner. Isleen finished the 2012 show year with a BIS win at the NKC November shows. 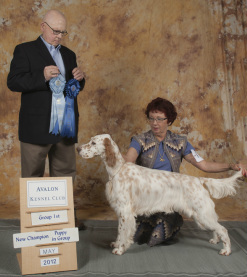 Isleen received the 2012 English Setter Club of Canada Top Puppy Award. We are looking to have some fun in the ring with my busy Queen Bee. 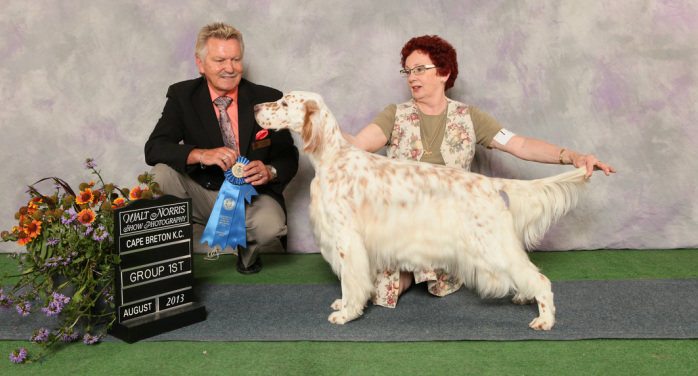 1st female Breeder, Owner Handler Grand Champion Excellent English Setter in Canada to achieve this title. In 2017 , Isleen was # 6 English Setter in Canada. Isleen has all 4 health clearances.